On our quick tour of Singapore, the first tourist spot that we have chosen to visit was Singapore Zoo, a 40 hectare rainforest filled with hundreds of wild and endangered animals, also dubbed as the best zoo in Asia. It is really big that I think one day is not enough to enjoy every corner of the said conservatory. Aside from the Singapore Zoo, there are River Safari and Night Safari too, which we failed to check due to time constraint. So, if there is another reason for our family to go back to Singapore, that is fully explore the Singapore Zoo. Fine sunny weather and less people in the morning but it can be very humid and heavily packed in the afternoon esp. during weekends and holidays. This is my elder daughter pointing a snail we spotted up on a shrub. She brought a notebook and a pen with her so she could write and draw her observation throughout the visit. I got mesmerized by these beauties. It was my first time to see them pink tall flamingos. I wished I could get nearer and touch them. Or do they bite humans? These two were obviously happy seeing live and breathing creatures underwater. We couldn't take a decent photo of the white polar bear so eto nalang. The Rainforest Kidzworld features a mini petting zoo, some rides, and water wonderland inside. In my opinion, this corner of the zoo is the best for families with small kids. I should have known about this part beforehand. I could've brought swimsuits, towels and extra clothes for the girls. Sorry no photo of the swimming area because my baby daughter cried and screamed a lot upon learning the she couldn't play in the water. 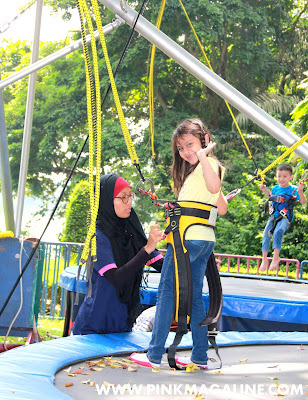 "Hi Mama", said my brave little miss before bouncing on a bungee trampoline. Spotted a sleepy koala. Shhh. Silence and no flash photography please. real penguins. See the difference? Now that was the biggest and cleanest zoo we ever been too. There is nothing like it. Will definitely go back to this place.